If you like delicious food cooked perfectly and served with the best seasonal ingredients, as part of a regular menu or choice of Specials, also t suit the season and weather, then Club Palm Beach’s Bistro is for you. Exhausted after yet another big week Friday meant time to not cook but have something dished up – and not cleaning up afterwards either. 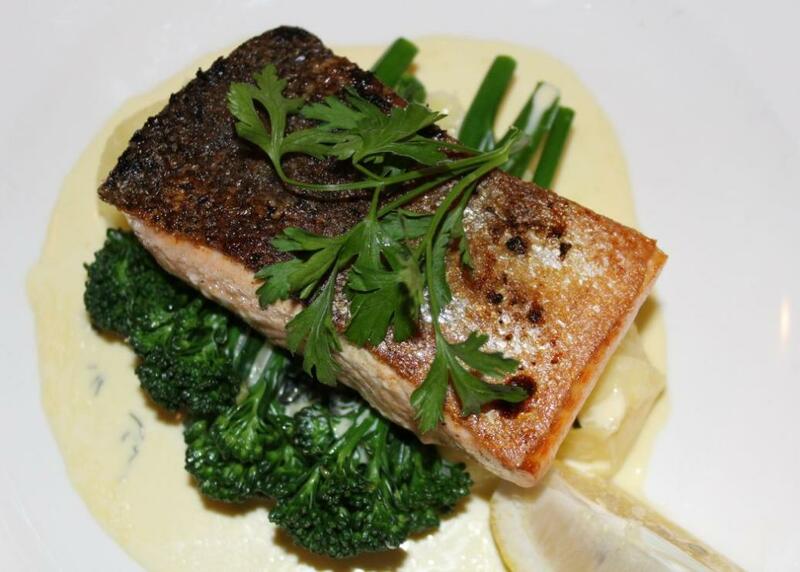 One had Crispy Skinned Salmon with steamed broccolini, mash & basil cream sauce 27.00 for Members 29.00 – part of the always available Menu. Wonderfully fresh fish, just pure bliss. The other had a 300 gram Scotch Fillet topped with avocado, grilled King Prawn and Hollandaise served with a red wine jus, and a bacon and potato salad - $32.00. Other favourites such as Beer Battered Flathead Fillets with chips, salad & tartare sauce ($25.00) or Polenta crusted Risotto Cakes with roquette, parmesan, walnut salad and chilli jam ($17.00) or the ever popular Schnitzels, Steaks and Roasts and a Children’s Menu are always available. Club Palm Beach is also offering a special ‘Summer Bay Tour and Meal deal’ if visitors from overseas wish to see the sights and then tuck into something delicious. This includes a half hour tour in the Club Palm Beach mini-bus and a choice of the Roast of the Day, Chicken Schnitzel with salad or Fish and Chips with Salad, all for $12.00 should be popular. Club Palm Beach also list regular one-off seafood Specials, such as their Lobster mornay or fresh Sydney Rock Oysters - you usally have to be quick to get these though. With an extensive Wine List, a sheltered outdoor eating area, and a relaxed laid-back Palm Beach atmosphere, this local club is for residemnts and visitors alike. The Bistro is open for lunch from 11:30pm to 2:30pm daily with extended hours during the summer months and open for dinner from 6:00pm to 8:30pm every evening.